Almost a year ago Harry Mattison from over at Boost Your BIM had a couple of posts that he used as an introduction to Events in the Revit API, particularly printing events, and in doing so showed a couple of ways (here and here) to implement a no plot type functionality in Revit. We took that kernel of an idea and decided to build our own, and ended up with a command that can can be used to turn almost anything into a non plotting object. It works by looking for the string “NPLT” in type names, line style names, and subcategory names. It will evaluate each view/sheet that you’re printing and hide everything that has NPLT in the name and also turn off the visibility of all subcategories with NPLT in the name. After the printing is done it will undo all of the changes that it made. It even works if you have view templates applied to your views. Because it can be making a large number of changes to many views, it does have the potential to add significantly to print times with large projects. So far I know of only one project we’ve tried it on that it affected noticeably, but your mileage may vary. 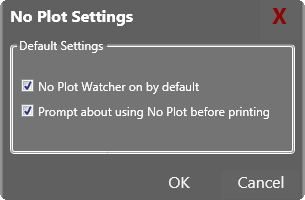 The No Plot Watcher panel that it creates has two buttons, one to indicate if it’s running or not, and another to change the settings. You can click on the No Plot On/Off button to toggle it’s active state and you can change the default setting through the Settings button. From there you can specify whether the watcher is on by default when you open Revit and you can have it prompt you when you print to see if you really want to use it. That way you can leave it on even with big, complex projects and still have the ability to turn it off before you try to do a large printing run. Right now it is limited to looking for the NPLT character string in element/subcategory names, but I’m thinking I’ll add another setting that lets you specify one or more strings that can trigger the command so it can be customized a little more. I’ve added 2013 and 2014 version in the download links below, so try it out and if you have any comments let us know.